One of the top questions I field concerns finding work on the road and becoming that ever-elusive digital nomad. I fund my nearly nine years of travel through freelance writing and consulting work—this is certainly not everyone’s cup of tea, but there are a lot of options out there for remote based work. Second most popular question is how I make money blogging; I don’t run any ads here so I am not the best person for that question, but many of the links and resources on this page will answer how others are funding a remote-based, freelancer life—the trendy term for which is digital nomad. I was a digital nomad before the term existed, but it does a good job encapsulating the lifestyle and goals of becoming a freelancer so that you can travel the world. If you’re already freelancer or a digital nomad, this page on my site is dedicated to listing the actual tools, programs, and products you need to run an work online. Everything from Evernote to Nutcache to the best online banks for digital nomads. In equal consideration to the above, I will note that working remotely is not ideal for everyone. It seems like a great idea and an easy life, but being your own boss comes with its own set of challenges. For those keen on building online work, below I’ll share websites, ideas, and opportunities I have encountered over the years that can either support a digital nomad lifestyle, or even build up secondary income to make money doing something you’re already passionate about (a side hustle). If you are interested in becoming an expat and finding a traditional job in an interesting place, the end of this post shares extensive resources on finding overseas jobs in traditional work or development work. Unlike the websites selling you courses on how to become a digital nomad, this page is a long deep-dive into actually finding paid freelance work, or online-based jobs that will support you on the road. No up sells, so courses, none of that—just my experience. If I recommend a book here, then I’ve read it. If I recommend something, then I use it. This page is a collection of sites, advice, and services you may find intriguing and useful. Of note is that these are often ways I have seen friends build up an online business; I do SEO and Online Marketing for small businesses and built out my client base over more than 13 years of networking and word-of-mouth. I believe that if you have the skills and dedication that you can definitely build online income, but it may not always be through the avenues you first imagine. There’s a variety of information here: hands on work in the field, building a business opportunities, teaching English … if you want to travel and work but don’t know where to start, this page will help. But first, let’s boil down the process, then get into the nitty-gritties that will give you real resources to make this happen. Identify a skill you already have, or one you would like to learn, that can be delivered online. Alternately, take the leap and plan to start your own business! There is a huge community of digital nomads running small (or huge) companies that run entirely online selling products or services to others. If you have a skill, you need to find remote work—there are job boards that can help. If you have an existing job you love, then it’s time to have a conversation with your boss about what remote-based work will look like. Start small if it’s new to your company—ask for a few work-from-home days to start. If you don’t have seemingly any skills that translate into remote-based work, then think about jobs that will take you overseas—it’s not quite the digital nomad life, but there is an incredible diversity of overseas jobs out there. Nix the plan to become a professional travel blogger (or photographer or travel writer), unless you seriously have a passion for it despite the odds, or if you have existing skills. Find digital nomad friendly locations to start your remote-based life. Not all places in the world are ideal for working and traveling, so choosing cities and an appropriate travel style are important first steps. If you have a marketable skill, writing, website design, graphics, things of that nature, then you may just be the lucky handful who can successfully travel and work from the road. You get double bonus points if you are already a freelancer. For those freelancers already planning a trip, make sure you have clients in place and some jobs that you know will come in as you are traveling. If you plan to travel and work as a freelancer in your trade then line up as many contacts and jobs as you can ahead of time and carefully plan out when you will go without internet! Freelancers may also need to slow down; I have stopped traveling quickly to save money and it works out well because costs lower significantly and it’s even a bit more fun than rapidly trying to see everything in one go. If you travel slowly a week in some places, a month in others, then you can travel for a lot longer on your initial funds and you can focus intently on a single freelance project before starting up again! It’s usually very easily to negotiate a discounted apartment/guest house rate for a month or more! If you are not yet an online freelancer, do a good deal of research on job boards to get a feel for what is out there and to you identify where you should start. You could also look to books by Chris Guillebeau for inspiration, Born for This and The $100 Startup are good reads that will give you an idea of what others have done before you. The next section will also include a huge range of ideas, links, and resources to begin building a freelance-based life. Note: Job boards and ideas for writers and photographers are in a separate section below. Remote OK: Founded by a digital nomad, this is site aggregates job postings that you could do from anywhere int he world. Slick and a good starting point; just type in your skill set and see what is needed out there in the world. NoDesk: Comprehensive and updated list of resources, ideas, and well organized for digital nomads. Hubstaff: This directory is free to list a profile and free to find freelance gigs — a nice change to the commissions most platforms take on both sides of the match. It’s newer than the rest — established in late 2016 — but growing quickly. Upwork (formerly oDesk): Depending on your skill-set, this is a great place to pitch for work and offer niche services. Building up a full freelance business can take years (and works best with word of mouth from happy clients) but getting started now is a step in that direction. The one con is that the platform takes a heft cut of fees. Problogger Job Board: An active listing page here and some really great options for those with some good web skills. Jobs Board on Freelance Switch: The free job board listings here have some gems occasionally, and are generally a good place you can look for work as you’re starting out. Roundup of Sites: The Globetrotter Girls rounded up a list of sites they have used over the years, many of which I hadn’t heard of before, some are niche to the European market too. Networking sites: Consider sites like AngelList, LinkedIn, CloudPeeps, etc. This allows you to find jobs not necessarily through a job board, but by finding relevant companies and then seeing what opportunities fit. Provide value, don’t just network for the sake of it. If you are professional and valuable in LinkedIn forums, you can help build your reputation. I will be upfront: Freelancing from the road has significant challenges. The idea of sitting working from a hammock on a beach in Thailand is a myth for many travelers. I love the location-independent life I have built, but it has drawbacks just like anything. I have traveled and worked since 2008, and I had many trade-offs within my travel experiences. For you, what you can do for freelance work from the road depends on your skill-set, your travel style, and what you’re looking for out of your travels and/or volunteer experiences. Working from the road means slowing down considerably, avoiding places without internet connection (yes, they do exist), and staying inside cranking out work instead of sightseeing some days. But there are options, and there are even travel-themed job options if you’re creative. Or, it might not look like that at all if you have some other skills. The jobs you can find are as varied as your interests. This MotoGuides site allows motorcycle enthusiasts to plan and guide trips around the world. Odd, hyper-niche things like that exist for nearly everything! One standard read for anyone looking to build an online business is the 4-Hour Work Week. No doubt you’ve seen it for years, but if you haven’t read it yet, you should. Some of Tim Ferris’ viewpoints are very counter to how I live my life, but I will give him this: his book changed my perception about what is possible in building an online business. It’s still a primer read for a reason, it’s worth having that knowledge and perspective in your head as you move forward. Now, if you are already a freelancer and you have clients in place and some jobs that you know will come in as you are traveling then you should be fine. I had one client who paid a large portion of my bills for the first several years on the road. For new freelancers, if you plan to travel and work as a freelancer in your trade, then line up contacts and jobs — the more the better. This will allow you a safety net of sorts as you fill in the gaps with other freelance work. And, as a freelancer, know that you will have to carefully pay attention to when you might be without internet! I really can’t stress enough that I think it’s important for many people to begin freelance work before they set out on the road. Traveling and working is tough, and launching a steady income through a freelance career can take unpredictable amount of time for every person. Consider starting in freelance work while you keep your current job and test out your skills, your contacts, and how you’ll juggle your time. This post has some great primer ideas for how to start freelancing while you’re still working. These sites will help you come up with ideas of how you might make online income. The first section covers how to find freelance work for those who have a trade. If you’re still figuring out the landscape, check out these links. 60 Companies Hiring Remote Workers: A long and well curated list of companies that let you work online, which is ideal if you are planning to become a digital nomad someday! 33 Travel Friendly Jobs to Consider: A long list of some creative jobs you can do overseas that you might not have considered before. Some great links and fun ideas. How to Find Remote-Based Work: This is a very thorough resource page that will send you deep into the world of location independence with interesting articles to read, websites to visit, and tools to use. Digital Nomad Jobs: An entire site dedicated to how to think about online work and how you can position your existing skills. 76 Ways to Make Money in Digital Media: A piece from Slate Magazine with a slew of potential jobs that would allow you to work remotely. Couple those ideas with some skills building, and the jobs boards listed above, and you have a good start. Word of Mouth: The number of work opportunities that have fallen into my lap on the road are astounding. If you’re open to a variety of fields then consider getting a nest egg to propel into traveling, and then seek out work on the road – the work is there but many places aren’t advertising online, so walking into an NGO, a café, a hostel, school and looking for local work is surprisingly effective. World Wide Opportunities on Organic Farms: Referred to as “WWOOF-ing, this site offers travelers and nature lovers the information and connections all over the world with organic farmers who are willing to trade accommodation and food in exchange for hard work. This is a great way to neutralize travel costs, see a different side of a country (these farms can be remote) and keep travel costs low. Side Hustle Nation Podcast: In case you’re an auditory learner, here’s a great podcast with a phenomenal range of stories and examples to spark ideas. 101 Best Side Businesses: A good list that also includes action steps for getting started on each one. 60 Side Hustle & How to Start Them: More than just a list of ideas, this site gives a lot of detail on each idea that may help you execute the idea effectively. Some of these are location-dependent, but dig through because there are a few remote ideas too! (I love the idea of remote fitness coaching and such). 37 Side Hustle Ideas and How to Get Started: Some more good ideas to consider. Should You Travel With Your Laptop: This is a no-brainer for freelancers, but it’s a good read on other options if you’re on the fence about a traditional RTW trip or working and traveling. Things I’ve Learned from Being a Digital Nomad: Great post looking at the realities (good and bad) of building an online business and making a location-independent life. There’s a bit of a fallacy for many that remote-based work is all hammocks and beach-side margaritas. There are serious challenges as well. There internet is the biggest one — how to stay connected and deliver work on time becomes an almost obsessive issue when you’re actively traveling. If you pick an expat spot, this is easier, but there are still issues and challenges. How do you navigate the visa situation? How do you actually work where there’s cool stuff you could be doing? Even something like scheduling meetings in different time zones is an issue (this site is great for that). Here are a few resources you might need to overcome possible issues freelancers and digital nomads face when they hit the road. The visa situation varies widely depending on where you are traveling and your goals. If you are backpacking and moving rapidly on a RTW trip, you generally will just enter on a tourist visa and continue to work for your clients without any special visa status. To do this, your income earned should be completely outside of the countries you are visiting. If you are doing all of your work online, and you don’t need more time than a tourist visa, then you are generally OK to just work from abroad and have your income deposited in bank accounts abroad. If you are not earning money from the country you are in, then you are not “technically” working there. This is what all the expats are doing who “live” in Thailand, Saigon, Mexico, etc. They are simply there on a tourist visa and they usually leave the country once their tourist visa ends, then they re-enter on a new one if they want more time. In some places like Thailand, this works for a time, but then they stop issuing you visas when it’s clear you’re living there. But again, the tourist visa will work if you are simply on a RTW and earning money. Let’s talk about Europe. I am not an expat there, but I have heard of options over the years. Germany is a popular option for those wanting entry into the EU zone. Germany has an “artist’s visa” that allows foreigners to live legally in Germany/the EU. You’ll pay fees to go through the process, and then you are obligated to buy health insurance annually too, but I hear that it’s fairly easy to extend for years in a row. Portugal has options, Eastern Europe has a few loopholes, but they are closing them. Consider that some European countries will tax your worldwide income when you “work,” even if all of your clients are outside of Europe. OK, let’s say you are on a RTW and mostly entering countries on tourist visas, what do you tell the immigration officials? I rarely explain my online work because it singles you out for questioning. It’s just easier to name your profession’s genre and don’t explain unless they ask. I never volunteer information that I run a business online, I generally answer the occupation question with something like “marketing specialist” or “writer.” Most countries still don’t have firm policies on things like this, so they’ll be as confused as you are if you mention it. I have never overstayed my tourist visa, so they don’t ever question me very much. The UK is an exception — they are very strict. When you enter, answer their questions truthfully but succinctly. For non-Americans and Canadians, this resource shares ideas on working legally in North America. The digital nomad forums will also have a lot of resources (those are linked at the bottom of this page). I am as susceptible to distractions as anyone. In fact, my long hours online led to crippling RSI injury. Now, I have to use an ergonomic travel setup for my computer, and it has helped. But being more productive in my online time is also important. I use a series of apps to minimize distractions and ensure that my online time is actually effective. StayFocused: This app on Chrome keeps me from opening Facebook and Twitter while I am focusing on work. Trello: I use Trello to track all client work, and I use a “Getting Things Done” system for my own board to track and manage tasks. They have an iPhone app as well. If you haven’t read the Getting Things Done by David Allen, you should. It’s in both print and Kindle. Evernote: I bookmark things in Evernote, and also collect all my travel details in Evernote. Although the free plan works for most people, I pay for premium to support them and their products. They have an iPhone app as well. Tweetdeck: If you’re on Twitter, this free client allows you to easily schedule information for multiple accounts. Pocket: I store all my good online reads here so I can easily read them offline and schedule them for sharing, or pull notes, etc from them. RescueTime: This time management app tracks your activity when you on the computer and allows you to accurately track and bill clients. Especially good if you work on a range of projects throughout the day. The Complete Guide to Breaking Your Smartphone Habit: These piece has heaps of apps and suggestions for limiting usage of sites and programs that keep you off-task. 79 Tools for Your Business: If you are launching a business, many of these tools may solve your issues. As a freelancer, I have different needs and tools, so it’s interesting to see what Ryan uses to maintain his online businesses. If you are less keen to work from a computer, but you dream of living overseas, then you have some options. The next section looks at the most popular route for 20-somethings — teaching English. This section, however, assumes that you have some solid skills and just need the ability to research and apply to jobs overseas. These type of sites are looking to hire part- and full-time workers who will live as an expat overseas. Most will also pay a decent salary and help you arrange the work and living visa permits if you are hired. There are unskilled options too, but these usually look like au pair and nannying jobs, assistants, and things of that nature. This section is for skilled workers looking to find international jobs. Jobbatical: Jobs overseas that are hiring short- and long-term workers. Nice interface and a great list of jobs in different skill areas. Interaction.org: A slick interface, the organization is an alliance of US-based international NGOs. Use the site’s member directory to search for a company that may need a skill you have. Going Global: Though part of the site has paid services, the country profiles are wonderfully detailed, list out organizations, business profiles and a huge range of useful information. ReliefWeb: Start here for many development jobs all over the world–it’s easy to search and full of opportunities in many fields. This is perhaps the single most popular way for most people to realize their dream of traveling/living overseas. And while I am not an expert on this, having only taught English as a volunteer, I think it’s an amazing way for someone with the skills and desire to finance world travels post-college (it’s possible post-high school, but many better jobs require a four-year degree). Past that, the requirements for teaching are simple enough, there is very little cost barrier, and there is a huge demand for native English speakers teaching in countries like Korea, China, Thailand, and Vietnam. Also, there are numerous ways to teach various languages and skills through the internet, through Skype, and other mediums. If your goal is simply to be overseas living and working, teaching English at a foreign school might be ideal. If you are committed to doing entirely remote-based work, then there are avenues for teaching languages online as well. Buddy School: This is a no-brainer and the threshold for entry is quite low. No matter what language you speak, there is likely someone looking to learn it. You can also do it right now to build up a base of clients if you plan to travel, or bring in an easy secondary income. Notably, you can teach whatever you want or whatever skills. Though teaching your native language is an easy option, any other hidden skills and hobbies that are teachable by Skype can be offered on Buddy School. Tip: As you’re getting started, low-ball your rate ($10 an hour for English teaching) and invest a small amount in an advertisement on the site (US $20) to get your first few clients. At that point reviews from those clients propel you higher in the free searches and you can raise your rate. A friend here in Thailand completely supports herself using Buddy School and used this advert/$10 method. iTalki: I only know about this site from the learner’s perspective. A friend used this site to practice Spanish. It has a strong community and you could surely find clients there if you had experience and a willingness to work their system. They accept teachers in a range of languages as well! Englishtown English Language Teaching: Much more stringent requirements than BuddySchool, you have to have a University degree, be a native English speaker, and have a year of experience, but the classes are online and provide flexibility if you meet these requirements! If you are experienced then you can also make a good deal teaching specialized English. This means focusing your tutoring and classes on things like medical English, passing a specific exam, law English, and things of this nature. Niche English teaching is profitable and can work well for those with past experience in a good niche market. For this you could work connections, offer skills through the larger training websites aimed at that niche, and even consider local Craigslist listings in non-English speaking countries. Obtain TEFL, TESOL, or CELTA certification: Take a course—tons are offered online—from a credible source and you will receive certification to teach English as a foreign language. (A US-based professional organization has more on that). There is work abroad without this, but if you’re looking for paid work and a very legitimate setup, certification is necessary. Choose your country, there are pros and cons to many regions, and personal considerations to take into account (any place you’ve dreamed of living—start there). Then research on travel blogs and sites to read real stories from English teachers in that region to get a feel for what it will be like. Some places have better perks, like most jobs in China include accommodation, but the downside being they are in remote towns with few other foreigners. Thailand takes English teachers, and is full of expats and Western amenities, but the pay is pretty low. .
Find credible job boards or list your resume with recruiters. Negotiate your rates and what is covered, some teaching jobs will help pay moving expenses. If you’re traveling and looking for work, ask around, many friends networked their way into great teaching jobs just by asking around in the local communities. A How-To with Many Resources: The best roundup I have seen on the interwebs with each part of the process explained with pros/cons and resources. Caz and Craig give a lot of options and tips from their personal experiences. Top Money-Making Teaching Jobs: Some good resources here and the post lists out which countries pay the best, as well as forums you can look to for finding these higher paying teaching jobs in Saudi Arabia, Korea, China, etc. How to Teach English in Korea: Andrea and Matt lived and taught in Korea and share the best resources, job boards, and relevant information on teaching in Korea specifically. Tips for Teaching English Overseas: Samuel shares this guest posts with some of the hurdles to avoid and insider tips he learned on his own teaching travels. An e-Guide for Teaching Abroad: Nomadic Matt wrote an e-guide to teaching overseas. Though you can find most of the information scattered around online, if you’re keen to have the easy route it’s cheap enough and good value. Teaching Traveling: Lillie is a fellow traveler but she is also a teacher in Boston and started a site to specifically help teachers find work abroad and navigate that transition. She is the first place I send people who ask me for teaching overseas inspiration. Unless you already have avenues to sell your photos this is a difficult path to money. It is hard to sell travel photography and I know professionals who don’t make money from selling prints online, but rather from specific gigs they’ve gotten through networking and exposure within the industry. It’s a fast changing industry, and one travel blogger/photographer outlined the various he makes money in 2015 in this post. It’s a solid read and shows how you need a lot of various projects to make a living from photography, the same holds true for writing. If you’re a pro-photographer however, let’s talk more. The problem is that the market for photographs of a destination has changed in the past few years. As travel blogging rose, tourism boards learned there was more value in combining their coverage. Instead of hiring a pro-photographer to take marketing photos, they can spend that same budget on travel influencers. They can bring someone like Liz Carlson or Gary Arndt into a destination for the same price as a pro, and in addition to the gorgeous photos, they get social media amplification. The travel photography market has become a lot about numbers and followers, no matter how good the photographer. So let’s say you take beautiful photos and you don’t yet have any online following, there might be opportunities. There are several blogger collectives and media agencies that have popped up since about 2012. These collectives then pitch tourism boards and destinations on packages for their events and locations. If you have a gorgeous portfolio and years of experience, then you might find work through creative pitching. You could approach a blogger collective in case they have a need to include a strong photo element to the pitch that bloggers wouldn’t be able to cover (like at a festival or some such). One blogger collective that is really big right now is iAmbassador. Other travel focused media groups include Hecktic Media and Stay & Wander. In general, these collectives work with the tourism boards and start bringing on a blogger when they have something in the 80k range of followers. But, working for yourself becomes a lot about how much you are willing to advocate for your own business and skills. There is no telling if a collective would be interested in having an actually great photog on their rosters to include in pitch packages for coverage. Since I am not a professional, I’ll let some current pros talk a bit more about the pitching landscape. These are both fantastic reads that should get you up-to-speed on the travel photography landscape. While you’re learning about how travel photographers are working in today’s current landscape, I’d be remiss to not mention just how important social has become. While you’re finding and pitching, you should strongly focus on building an engaged Instagram following. Instagram is the darling of social media right now. The network is growing exponentially every day and it’s particularly well suited to showcasing a portfolio of images. In short, you need to learn this network and gain followers. There will never be a time that growing your following as you seek paid work is a bad thing. How do you grow an Instagram following? There are tutorials online until the cows come home, but here are a few starter ideas. On every post, extend its reach with tags and hashtags. Tag the tourism board for the destination, find out that destinations unique set of tags and then use them. The IG search feature makes it easy to find some, then go look at photos and see what others are using. For Mexico, I know there are at least 10 Mexico-specific hashtags I use when I am there. These tags usually put my photo on the radar of local IGers, but also larger accounts that promote tourism in Mexico. Using these popular hashtags can help you get a repost on popular pages. They then give you a shout-out and help you bring in a boost of followers that is hard to get without big-page shout-outs. Travel writing is the holy grail for travel lovers. It can also be quite tricky to make money solely in this niche. Let’s dive right in. Airline magazines tend to pay well if you can pitch on their destination hub cities and get in with a few editors. Also, the holy grail is usually some sort of regular blogging or ghost blogging gig — even if it’s not in the travel niche. Heaps of companies need regular blog content. Tapping into your network and finding some of these companies can usually be a good source of “pay-the-bills” income. I write for a couple real estate blogs and keep them in fresh content. This is a good way to work as a behind-the-scenes writer while you try to land the larger gigs. New writers and bloggers should keep just three things in mind really. First, aggressively hone your skills and continually strive to become a better writer. Always build relationships within your community through social media—your own ability to amplify your writing on social networks is increasingly a part of the decision process in hiring writers. And you should start an email newsletter yesterday—email is the single best long-term strategy for building a direct line of communication with your fans and readers. Going into this with the right attitude is a big part of it all. I see many new writers feel entitled to work and entitled to a certain pay rate for their articles. We each have our living wage, and what we are willing to earn — understand that others may take that work for a rate you deem unacceptable, and that’s a choice we make when we enter this field. The large number of travel writers vying for work means that it will take time and relationships to build up to better paying writing gigs. Of note is that I don’t make my full income from travel in any form. Neither this blog nor my freelance work. My income is only partly from my own site, but a lot of it comes from ghost blogging for other sites and for travel brands. I also make a piece of my income doing marketing and SEO consulting, so I am entirely outside of the travel writing space for about 40% of my income. I also do more ghost writing now, which is something I did not do before, but I am happy to continue doing in the future as it’s a bit easier to write to others’ specification than to pitch work or write stories for my own site. I find it’s more like a job when I ghost write, and for now, I like it. I don’t see a lot of long-term income in travel writing, so I have always looked at it as part of a larger strategy. What connections do you already have? Can you pitch them? Are any friends in need of help with their business’ blog or social media? Set up a daily and weekly schedule of pitching. Check out the job boards listed above, many of these will have freelance writing positions. Have a website, even a basic one, that lists your skills and a portfolio of work that you can point people to. Work LinkedIn. I have talked with many freelancers who use the LinkedIn groups to offer up advice and put their name out there as a niche expert. Other sites like LinkedIn include CouldPeeps and AngelList. If you’re heading down the travel blogging route with the aim of making money, I recommend you read through this entire section first. These ideas will allow you to enter with realistic expectations, as well as the tools you need to enjoy it and find success. The short answer here is that yes, with hard work you can make money blogging. But, and it’s a big but, how you will make that money is likely very different than you imagine at first. Many travel bloggers making an income run multiple sites, sell advertisements, and/or make money by “teaching” telling others how to make money from blogging. It’s possible to find success on other routes, but it’s a lot harder. If you come up with a business model and ruthlessly execute it, then yes, you might just make it. IF you have a business, you should be reading about how to be a better entrepreneur, not a travel blog. If running your site like a business doesn’t appeal, then it’s a hard road to income. And upfront I will say that I will never try to sell you a “Make Money Blogging Course” — most bloggers neither need this, nor will recoup the expense. Before you drop several hundred on a blogging course, see if you even like blogging. Even without the income, you should enjoy the process of running a website. It’s a good start if you like blogging and you’re still running your site eight months later. Keep in mind, travel blogging itself is not a usually business, it’s one tool you can use to execute a larger business plan. Our industry is unfortunately far different that the fashion and food worlds — there is far less money trickling down from brands to the smaller blogs and social media accounts. The realities of travel blogging are that it’s hard work to edit photos, write posts, engage in social media (Twitter, Facebook, Instagram) while uploading content on dial-up speeds. There is a great community of bloggers, but please don’t start a blog with dreams of making money, it’s not the reality for the vast majority of bloggers. If a blogger is selling you a “how to make money blogging” course, be skeptical (this is how they make their money). Travel Blogging and Capitalism: If you’re wondering about the dynamics between bloggers pushing a paid product and their revenue models for monetizing their blog — read this well-thought out and legitimately critical post. I don’t mean to sway you from blogging, but more to equip you better when you start researching on other blogs. How I Make Money as a Travel Photographer in 2015 by Brendan van Son; he started as a travel blogger but moved into photography and has an unflinchingly honest layout of exactly how and how much money he makes from travel photography and his blog. The Reality of Being a Professional Travel Blogger by Adventurous Kate. Six Years of Traveling Blogging; Leif’s a bit like your curmudgeonly uncle, but he makes good points. Best Blogging Tips from Professionals: A great Quora thread with thoughts and insights. There are a lot of travel bloggers and the low-hanging fruit was gone in about 2010. I have traveled the world for more than seven years on freelance income, so blogging itself is not the only path to remote income. Other links on this page can help you come up with business ideas, remote work, and other ideas too. It is not easy to make money as a travel blogger, and the amount of time it takes to share the stories, edit photos, and market usually turns out as a very poor investment on your time. That time spent building freelance income far exceeds the money I’ve made on my site since 2008 when it launched. As someone who has been blogging for years, I will tell you I make far more money having built up credibility and skills in my freelance career than the vast majority of bloggers I know who have spent equal amounts of time trying to make their blogs generate income. My monetary return on my time investment has been vastly higher, and I still managed to do it remotely while traveling all over the world. If you’re keen to build an income-generating travel blog, however, the next section has some more links to help you suss out how you might take that road. If you’re still sold on making a travel blog, welcome to the community! Let’s help you make it great. I wrote an easy step-by-step how-to guide on starting a new travel blog. Successful bloggers have all built strong communities around their sites; you can read my thoughts on building a community here. And check out the tools I rely on to run my online businesses. There is a lot of information out there for new travel bloggers. Here are some of the other perspectives I think give a well-rounded picture of what it will take, what it’s like, and how you should approach it. Every Single Thing I Know About Travel Blogging: Brenna is lovely and I respect her work. Like this site, she doesn’t focus on advertising and monetization, but instead of good travel narrative. Becoming a Professional Travel Blogger: There’s a lot of content here and links to read and ideas to process. Tips to Build a Travel Blog: This Buzzfeed piece collects some good suggestions you should keep in mind. YOUR NEXT STEP: Read through: Should You Start Your Own Travel Blog? and seriously think “What do I want out of my once-in-a-lifetime trip?” If the answer is yes, I have a detailed primer guide of the Five Simple Steps to Starting a Travel Blog. Also, if you already have a travel blog then read How Travel Bloggers Make Money, a post written by another travel blogger in the industry—it is surprisingly thorough and detailed. Brendan’s post above is also fantastic and recent as of 2015. If you’re keen to start one, check out my resource page for bloggers and other digital nomads getting started with working remotely and in need of the best tools to help them be productive on the road. As a new blogger just heading out, there are a lot of considerations. When I started, I had no intention of monetizing my site and making it a business — that shaped how I developed the site over the years. There are two paths I am often asked: building a profitable blog, and becoming a travel writer or photographer. Those are two very different, and only sometimes overlapping, areas. 1) Read this page on how to build a community. Here I clearly outline the importance of building your audience, as well as examples of how I built ALA over the years. You need to pick your social media platforms, find your voice, offer value, and then really dedicate yourself to building an audience before you start advertising or seeking sponsorship. 2) Choose a business model. A blog is not a business. The previous step’s page on community includes an entire section about various blog business models. If you’re going the route of affiliate marketing, I have a small subsection just below with ideas and tips. 3) Build authority. Gary, a top blogger did a video Q & A on building authority. It’s a good listen filled with advice. Having a point of view and a solid story is also a good way to build a lasting brand. Reporters know they can come to me for an experience opinion on volunteering and grassroots tourism. What’s your authority subject? 5) Always get better. Through all the steps, strive to become a better writer, a better photographer. Study marketing and SEO and storytelling. It comes down to making your blog a priority, and embracing blogging as a continual learning process. I can’t stress enough how much bettering your writing and photography will help as you embark on this process. Let me start by saying that this advice is targeted to bloggers who have decided to write for a love of it, not for an income. If you want an income you should be reading books and blogs on how to start a business. But if you have a website and you just want to sprinkle in some opportunities to make money for your coffee addiction, then read on. To my mind, there are two sides of making affiliate income. There are the big well-known brands that convert on trust, and there are small companies with products you love and use anyway. Many small companies don’t have affiliate programs, but some do. Affiliates run the gamut from Amazon to travel insurance to hotel booking sites. Picking the right affiliates for your website can be tricky. On ALA, I use Amazon. I was already recommending gear and products, so they made a natural fit. And because they are the largest online retailer where my audience lives, the United States, it made good sense. And while some of the brands I recommend have their own affiliate programs, the larger companies have more brand recognizability and trust — that goes a long way toward having your readers easily follow through on your recommendations. Even with the natural fit, it took me several years to make even a decent bit of monthly money from Amazon. This is because general affiliate programs like Amazon work best at volume — you need a good deal of traffic to make the trickle of small percentage revenue add up to a decent income. I also use World Nomads’ affiliate program. They pay a better commission than Amazon, and the base price of the purchase is higher, so you need fewer sales to make money. More than just adding WN to my sidebar though, I wrote a very thorough breakdown on why I picked them way back in the early days of backpacking, before I even knew what an affiliate program was. This review oozed honesty, because it was honest. Over the years, I have kept that review updated and added more value by continuing to honestly share with my readers when WN works best, and when another travel insurance company might be better. A side benefit of honesty and actually picking affiliates for companies you use is that many readers buy through my link. Another way to pick a good affiliate is by looking at the content you write. And if you’ve been blogging a while, you will be best served by choosing affiliates that align with your site’s most popular content. There are two posts that went viral on my site, and they form the bulk of my income. I added resources boxes to my high trafficked posts with links to my WN review, and to related Amazon products. Doing this made a fair bit of difference in my affiliate income. Review posts of products you love also have twin benefits of being helpful, and they can do quite well in the search engines. Now let’s talk about brand ambassadorships. If you have a good niche site (and you should if you read my blogging advice! ), then think about the gear you already use and love. Sometimes, smaller companies have innovative opportunities. If you believe you have enough site and readers to truly provide value to their brand, then you could email the company and see if they want an Ambassador relationship. Above all, I would look at your top ten posts from search engine and social media traffic and see what happens from there. Analyze those posts and consider relationships that would allow you to share helpful resources on that post, but to also send the reader out on an affiliate link. This method will not make you millions. For that, you need a business model and a ruthlessly executed business plan. But readers have emailed over the years asking about the small ways that I do monetize ALA, and this is now my official line on this whole affiliate business. If you are looking to get into travel writing and journalism, it’s less about your own personal website, but your social media numbers still matter, so go read that community building page in step one. If you’re moving into travel writing, and the blog is a side project, I would look at pitching all over the place for regular features as you are on the road. Try everything from your hometown newspaper to magazines — wherever you can. The money is crap, especially in the beginning, but it can happen! (this site can have some good ideas of rates in various places: http://whopays.scratchmag.net). Finding your freelance work and organizing your freelance life (both covered above), are only the first steps in working from the road. Now you have to pick a freelancer-friendly place (or places) to visit and figure out the hows and wheres. There is a huge community of digital nomads all over the world. In the past several years community forums have popped up, there is an entire subreddit for digital nomads, podcasts, and more. Nomad Stack: This is a site filled with other resources and links to every area of research you might need, from job-boards to networking sites. Work From: I dig this site as it’s less about startups and expats and focused on helping you find coworking spots and good wifi cafes all over the world. Ideal for travelers, and even expats moving to a new city for a bit. Startup Blink: This site has a neat interface that lets you view a map of the world with information laid on top. Sort by coworking spaces, startups, accelerators, and more. Teleport: They have an interesting interface that let’s you pick a start-up scene as a priority and it will help sort cities you might like. It has a large mix of unorthodox spots in Eastern Europe you might not have considered. NomadList: Sort destinations by cost of living, amenities, air quality, and more. 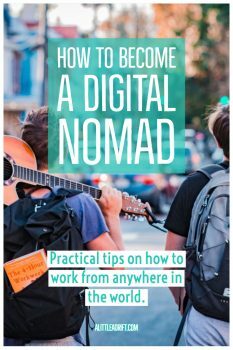 This post by James of Nomadic Notes lists other fantastic resources that will help you join the digital nomad community, tap into their knowledge base, and meet up with other freelancers on the road.